Maybe they should switch lanes? Remember t.A.T.u.? You know, that pair of Russian girls? The one that pretended to be lesbians to bring forth equal amounts of attention and controversy from the media? I'm not sure whether they were known more for their music or for their portrayal of sexual lovers in short-skirted schoolgirl outfits (or less). Either way, you can thank their former producer for pushing them into the spotlight with that gimmick; it must have paid off, because their debut English album, "200 km/h in the Wrong Lane", has reportedly sold over ten million copies in its life span. Their first album, "200 Po Vstrechnoy", included many of the songs featured here, except in Russian, alongside a few others we in North America never received. I'm going to try and focus on the music itself, rather than the sexual commercialization of the duo, but it's going to be difficult, considering that this aspect occasionally wedges its way into the songs. First up is Not Gonna Get Us, a relatively dark song about... well, not going to be caught by someone, presumably because of a controversial relationship. Immediately, we get to hear the intertwining high vocals of t.A.T.u. members Yulia Volkova and Lena Katina, whose individual voices are not easily identifiable at this point. The chorus is pretty shrill, to say the least, but backed by a dance beat, it's a bit more tolerable. Intermittent bursts of relaxing music break up the pace, but Not Gonna Get Us doesn't quite get me going. It's All The Things She Said, the first single off the album, that perked more than a few ears (and not because the girls kiss in the rain wearing Catholic schoolgirl uniforms in the infamous music video). This one's far more catchy and features some rock guitars in the otherwise pop chorus while they repeat the words "All the things she said". Again, this song focuses on another relationship doomed to fail by the judging eyes of others (including their parents, as mentioned specifically in the lyrics). All The Things She Said actively summarizes the attitude of t.A.T.u., even if it is artificial. Show Me Love starts out with a phone call between possibly the two girls of t.A.T.u. overtop a ballad-style instrumental. The girls show off their quieter, whispier singing chops here, though they soon get to shout again with a corny refrain with such deep lyrics as "Show me love, show me love, show me love, show me love, show me love 'til you open the door." Classic. It's still a pretty decent song, especially the energy of the chorus. Then 30 Minutes cools us down with a piano-led ballad and the girls' delicate vocals. The soft laughter in the background is a bit of a brow-furrower, but it's still a relaxing and refreshing track. Next is How Soon Is Now?, a cover of the 1985 song of the same title by British alt-rockers The Smiths. And the rock aspect is definitely here, fueled by use of power-chords through most of the song. The vocals sound rather strained sometimes, though; they're really pushing themselves! Though the song as a single received mixed reviews, the writers of the song (The Smiths) actually liked the t.A.T.u. version. Hmmm. Clowns (Can You See Me Now?) follows it up, and it's passable. I have no idea what this song is really about, but I predict that t.A.T.u. is suffering from some sort of hallucination involving clowns. And they're also having vision problems. There's nothing particularly notable about this track, and I tend to either skip it entirely or forget it even exists. Malchik Gay translates in English to "Gay Boy". With an acoustic flair, t.A.T.u. tackle the issue of homosexuality (as if their stage show didn't do that already). I imagine the original Russian lyrics were more powerful as, aside from the actual use of the phrase "malchik gay", this is very little more than a standard love song. Of course, coming from a female perspective, it's all about what they can't have: the boy of their dreams. I do like the use of the vocoder for the bridge, though. Kinda neat. The last original song on the album is Stars, which I would identify as a cosmic ballad. With a saxophone to help lead the way, filtered Russian lyrics (not translated ones) fill the spaces between each chorus. They intertwine near the end, and it's a pretty nice ending to this part of the album. A few extra tracks round out the package. Yo Soshla S Uma is, essentially, the Russian version of All The Things She Said as it was originally intended to be heard. If you want to know what the song would sound like with a cute strong Russian accent, look no further. We also get Nas Ne Dagonyat, the original Russian edition of Not Gonna Get Us. And, for some reason, there's also Show Me Love (Extended Version) with some extra funk at the beginning. That wasn't really necessary. 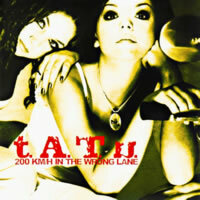 "200 km/h in the Wrong Lane" isn't a terrible album by any means, but there isn't anything particularly exceptional on display either. Much is lost in the translation: lyrics that may have sounded heartfelt in Russian feel clumsy or inelegant in English. Add to the fact that we only get eight original songs (the last three tracks don't really count, as they're basically duplicates), and the supposedly full-length album is, in fact, only a little over 29 minutes in length. Fans of pop music with cute voices will love this, as will fans of girls who kiss each other in public.